"None of the information contained on Jim Cramer's Mad Money or in any of his shows, (Mad Money, Stop Trading or RealMoney) constitutes a recommendation by Mr. Cramer, TheStreet.com, Cramers-Mad-Money.com or CNBC that any particular security, portfolio of securities, transaction, or investment strategy is suitable for any specific person. You must always make your own decisions when decide to invest in any particular asset weather it is a stock, security or otherwise that may be mentioned on this site. Neither this site nor anyone in affiliation of this site guarantees any specific outcome or profit, and you should be aware of the real risk of loss in following any investments discussed on Jim Cramer's Mad Money. As with any stock, the price will go up and down and it is possible for you to get back less than you invested. Please note this risk and that this show, its owner and affiliates recommend that you seek advice from your personal financial advisor. This show has no affiliation with CNBC, Mad Money, Stop Trading, RealMoney, thestreet.com, or Jim Cramer and is not liable for any of the recommendations given on this show." Let's boil this down a bit. 1) Nothing I say is considered a recommendation. 2) The advice you find here may not apply to you specifically. 3) You must always make your own decisions. 4) We don't guarantee any outcomes based on any information you find here. 5) You could really lose money taking this advice. Really. 6) We recommend that you talk to someone about your specific situation before you jump in and just start doing things because they were casually mentioned here. 7) We're not responsible for anything we do or say. The implied, but unstated conclusion is: You're responsible for what you do. Online, I live by a similar disclaimer. I provide entertainment. So even if I beg you to do something, that's not advice. You're responsible for what you do. I'm amazed when I talk to people who say they took my advice . . . and did something I never recommended. 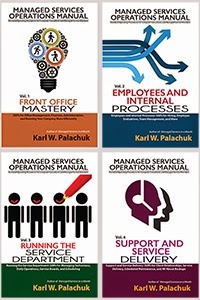 In particular, people read a book like Managed Services In A Month and then tell me that they followed my formula. But somewhere along the line, they're selling blocks of time, not getting prepaid, and 80% of their revenue is break/fix. Don't get me wrong: If you find success and want to give me the credit, I'll take the credit. But I can't take any blame for anything I say, because no two humans will ever implement something the same way. I say "dark blue" and you make your logo light green and tell me "Thanks for the great idea. It makes all the difference." The truth is, you couldn't implement my recommendations exactly as I do even if you want to. We start at different places, have different clients, sell different things, have different staff, etc. The best you can hope for is to find some idea or inspiration and integrate it into your complex reality. One of the primary reasons I like to go to nerd festivals and conferences is that I get to meet more and more people who are in my business, doing what I do, and trying new things. When we share ideas, I find little bits of gold I can take back to the office and use in my own practice. The online forums are the same way. You never know when you'll come across something that fits your needs exactly. So please remember these simple rules. - If it works, I'll take the credit. - If it doesn't work, I can't take any blame. - You're responsible for what you do. 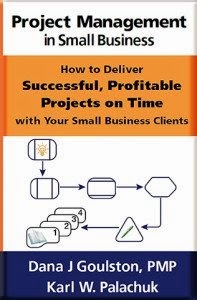 - This blog has no affiliation with KPEnterprises, Great Little Book Publishing Co., Inc., SMBBooks, The SMB Conference Call, Promotion Monkey, I5PC.com, or Karl W. Palachuk, and is not liable for any of the recommendations given on this blog." Karl - I think in many cases the "Thank-you so much, your advice changed my business" feedback you (very deservedly!) receive is actually more realistically "Thank-you so much for giving me the ideas and sparking my enthusiasm to go out and change my business". So even if the good readers of this blog don't do exactly the stuff you've actually suggested, you should take huge credit for inspiring a lot of people to try something different with their business.